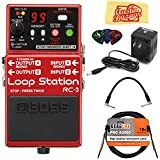 You are here: Home / Guitar Effect / Boss RC-1 Vs RC-3 Vs RC-30 Vs RC-300 Loop Station Review ! ​Loopers are an indispensable gadget in a musical recording or performance. 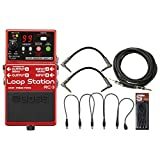 While it is generally associated with guitarists, loopers can be used by all cadres of musicians, performers, and artists. 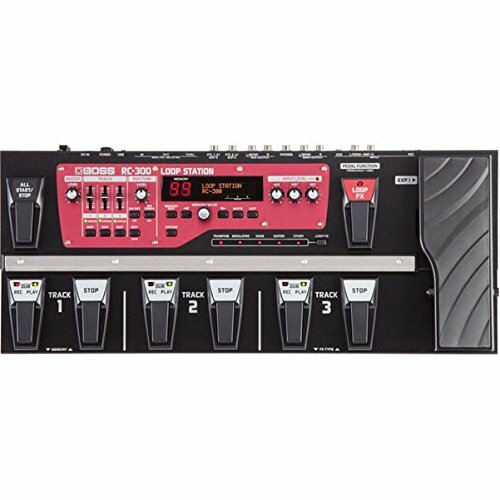 The Similarities between BOSS RC1, RC3, RC30, and RC300? The Differences between BOSS RC1, RC3, RC30, and RC300? 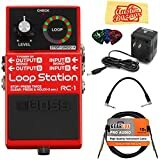 Since the release of the first looping station by BOSS in 2001, loopers have come and gone in all sorts of shapes and sizes and loaded with a variety of features. However, BOSS has continued to blaze the trail in this regard, continually furnishing the musical industry with reliable and effective looping stations. So, you might be considering getting one or, perhaps, changing an old one. Yes, there are many options out there, even with BOSS products. How do you decide which to choose and which will best meet your needs? As already said, BOSS is the pioneer and leading manufacturer of looping stations. As such, we shall be comparing FOUR of their looping stations in this article. These four products (RC1 vs RC3 vs RC30 vs RC300) are unique in their own rights. So, we shall be comparing and contrasting them with a view to helping you make an informed decision. Keep your needs as of now, and in the immediate future, in mind, as you read about these products. In discussing the similarities of these models, it is important to note that some similarities cut across all the four models while some just across some of them. Regardless of the model, each BOSS loop station is built according to BOSS’ renowned quality and performance. Each of the models has a least one pedal for looping functions. All of the models have memory storage for your loops, though in varying capacities. Each of the four models has stereo inputs and outputs to enhance your stereo effects while recording and performing. The RC3, RC3, and RC300 each has 99 onboard memory locations except the RC1 which has only 1. The RC1 has a maximum recording time of 12 minutes while the RC3, RC30, and RC300 each has a maximum recording time of 3 hours. The RC1 and RC3 has one stereo track each. The RC30 has two stereo tracks while the RC300 has 3 stereo tracks. RC1, RC3, RC30 can be powered by alkaline batteries or by optional AC power supply. The RC300 can only be powered by AC power. Both RC1 and RC3 has a pedal each. 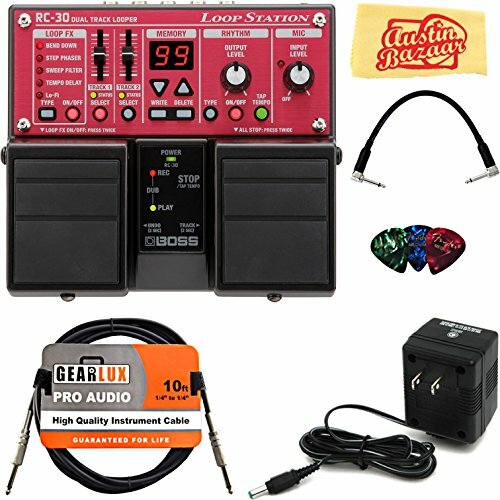 The RC30 has 2 pedals, and the RC300 has a pair of REC/DUB/PLAY and STOP pedals for each track, an expression pedal, an all START/STOP pedal, and a LOOP FX pedal. The RC3, RC30, and RC300 models have the Auto Record feature. The RC1 does not. The RC1 does not have a USB port. The other three models do, for external storage of loops and for importing and exporting WAV files. The RC30 and RC300 models have an XLR input for microphones. The RC1 and RC3 do not. The XLR input in the RC30 and RC300 comes with phantom power. The RC1 and RC3 do not have an XLR input or phantom power. The RC1 has only a 24-segment circular color LED indicator. The RC3 has a 2-digit LED display for indicating the memory location, a REC indicator, and a PLAY indicator. The RC30 also has a 2-digit LED display for indicating the memory location, a REC indicator and a PLAY indicator. It has power on and mic-on indicators, and a STATUS indicator for each of the two tracks. The LOOP FX has five indicators to show BEND DOWN, STEP PHASER, SWEEP FILTER, TEMPO DELAY, and Lo-Fi. The RC300 also has a small LCD screen that houses a 2-digit LED display for indicating the memory location and a two-line LCD display screen. Each of the tracks has a REC indicator and a PLAY indicator. It has an INPUT LEVEL peak indicator and each of the 3 tracks has a STATUS indicator, while there are 5 LOOP FX indicators for TRANSPOSE, MODULATOR, VOICE, GUITAR AND OTHER. For all these four models, when REC and PLAY indicators are both on, the unit is in DUB mode. The RC1 only has one knob to control the loop’s volume. The RC3 has a knob for loop volume and another (inset into the former) for rhythm volume. It has UP and DOWN buttons for the memory location display, a WRITE/DELETE button, a RHYTHM ON-OFF/TYPE button, and a TAP TEMPO button. The RC30 features UP and DOWN buttons for the memory location display as well as a separate WRITE and DELETE memory button. It has a volume knob for the RHYTHM and MIC, that of the MIC doubles as an ON-OFF knob. The RHYTHM section has independent buttons for TYPE, ON/OFF and TAP TEMPO. In the LOOP FX section, there is a button each for ON-OFF and TYPE. 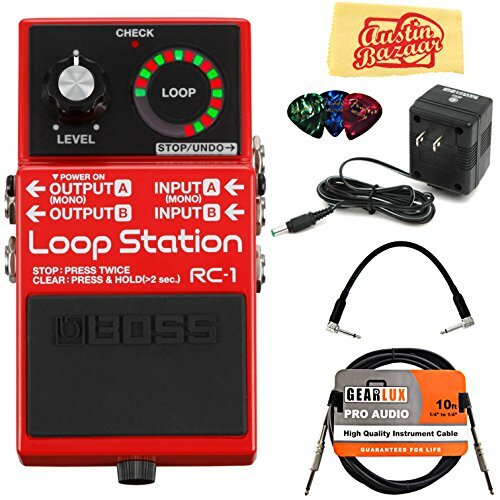 Whether you are a new or upcoming artist or an experienced performer, you will find the BOSS RC1 to be a simple and easy-to-use looping station. Measuring 2.9 inches wide, 2.4 inches tall and 5.1 inches from front to back, it has a pedal for setting looping functions (such as record, play, stop playback or erase recording), and a knob for setting the loop’s volume. It retains your recording even when the unit is turned off. With a maximum recording time of 12 minutes, you can record, overdub and playback loops. You can also redo or undo loops. The front has a 24-segment circular LED indicator which indicates the looping station mode (record, overdub or playback), and its speed of rotation indicates the length of the loop. The RC1 comes with a pair of stereo input and output each as well as a pair of mono input and output. It is powered by one 9 V alkaline battery that can last for almost 4.5 hours on a single battery and it comes with BOSS five-year warranty. ​Only one loop can be stored at any given time. 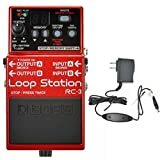 If you are trying out a looper for the first time or just looking for something to practice at home, you will find the RC1 right up your alley. ​Can the RC1 record vocals? Yes, it is possible. The RC1 will record anything fed into its input jack and it will also loop the same. ​​Can you pause the loop and then resume it? Yes. Absolutely! Just double-tap the pedal to pause and again to resume. 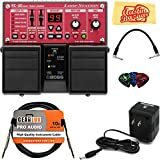 ​Can a mic and guitar be connected to an interface and then connect the interface to the device? There are two inputs with the RC1 – a mono and a stereo jack. So, you can connect the mic and guitar to the RC1 directly separately. Is it possible to change the recording settings sequence? Yes. The default recording settings is RECORD > OVERDUB > PLAY. If you change it to any sequence you desire, it will retain that setting until the device is reset to default. This 12.9 x 7.3 x 5.9 inches’ looper gives you 99 onboard storage memories for your loops and up to a maximum of 3 hours of full stereo recording. It features a 2-digit LED display that indicates the current memory number in use. It also has a REC light and a PLAY light indicator (when both lights are on, the unit is in DUB mode). Its “real drums” rhythm guide provides you with pre-recorded rhythm types (such as Latin, R & B, Pop, Funk, Rock, and Shuffle). It houses two knob controls inset together with the inner knob controlling the rhythm and the outer knob controlling the loop volume. You can indicate the time signature for each recording as well as set the tempo via tap tempo. An Auto Record feature commences recording immediately you strike your first note on your guitar or as any connected audio player starts playing. It also features a count-in mode that gives you a bar of rhythm before record. Each phrase, with its time signature and rhythm, are saved in the unit. With the AUX IN jack, you can connect external sound sources, record their input in the RC3 and use them in a loop. An additional USB 2.0 port enables connection to a computer PC for import/export of WAV audio formats. It is also powered by a 9 V alkaline battery or, optionally, by AC power supply. BOSS offers you a five-year warranty on this device. Professional musicians looking for more advanced features in a simple-to-operate looper would find the RC3 more suited to their needs. How many loops can I play at the same time? Can I use a rechargeable battery with this device? It is not advised. They will not ruin the unit but rechargeable batteries will not supply the required power. Can I switch tracks while playing live? It is not easy. You will have to stop playing, push the track up or down button on the device and then play. How do I delete a phrase? Stop playback. Push and hold the WRITE button until “dL” is displayed. ​Take one look at the RC30 and you know it comes with a lot of great features for the determined artist or performer. 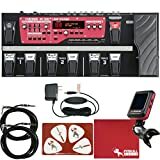 It is a multitrack looping station with in-built looping effects, dual synchronized stereo tracks, and the long-awaited twin-pedal. It has 99 storage memory phrases for loopswith a maximum stereo recording time of 3 hours. The unit features a 2-digit LED memory number indicator, track 1 and track 2 status indicators, power on indicator, and REC/PLAY/DUB indicator. There are buttons for selecting either of the stereo tracks and a fade slider control for each track. There is a knob each for the rhythm output and mic input volumes. The knob control for the mic also doubles as the off/on knob. The Auto Record features starts automatically with the playing of your keyboard, guitar, bass, or with singing or immediately a connected audio player starts playing. 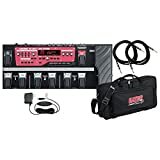 It has an XLR input with phantom power on/off switch, AUX IN, instrument in (stereo/MONO), OUTPUT (stereo/MONO), optional footswitch jacks, a USB 2.0 input slot for saving loops to external storage devices and for importing/exporting WAV files. It is powered by 6 AA batteries or optional AC power input and also comes with BOSS five-year warranty. Despite its sophisticated features, the BOSS RC3 Dual Track Looper is very simple to use and operate and as such, anyone seeking that added looping features for musical recordings and performances should be very interested in this device. What power adapter can I use with the RC30? While there are many adapters that might work with the unit, it is strongly recommended that you purchase the BOSS PSA120Sto avoid any damage to your equipment. Can I plug this unit into an amp? Yes. Like most musical instruments, it has a standard input and output jacks. Does the RC30 have built-in percussion? Yes. It has a number of easily controllable built-in percussions. Can one sync the device to midi tempo with USB? ​This powerful mega looper comes with 3 synchronized stereo tracks, with each track having its own footswitch and knob. This allows you to create, stack and manage multiple layers of loops while at the same time controlling each track independently. It also has a specialized expression pedal which can be used for effects control. It has a rhythm guide with a variety of rhythm types and a control knob for the rhythm volume. Tempo can be set incrementally or through tap tempo. The unit comes with a series of backtracks which you can use immediately for accompaniment during any performance. It also has 99 onboard memories and can record up to a maximum of three hours. It further has 16 onboard effects for looping. The Auto Record feature kicks in once you or any connected input device starts playing. It gives you a bar of rhythm before commencing recording using the count-in mode. The device has onboard effects (such as vocal effects, modulator, phaser, transpose, flanger, and much more) to help process your tracks and input signals. Its onboard effects can be instantly activated by its dedicated LOOP FX footswitch. The Expression Pedal allows for hands-free control of the effects’ parameters. 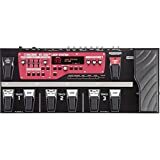 Who Should Buy Boss RC-300? 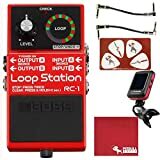 Professional artists and performers seeking a multi-effect looping station to enhance their recordings and performance with automated effects and features. 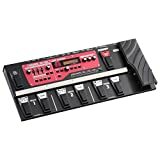 Can I use the Expression Pedal as a volume pedal? Absolutely! You will find details of how-to in the instruction guide. Can one program meter/time signature changes into the drum machines? If I record a loop of 2 measures on one track, can I record another loop of 4 measures on a 2nd track? Yes. But you have to edit that individual track and turn off the sync track feature. Is it possible to make, chorus, verse, and bridge with the same drum sound playing across all of them? Yes. When being used in Single Track Play Mode, you can assign each song part to a track. For example, Track1 could be the Verse; Track2, the Chorus; and Track 3 the Bridge. The RC300’s Rhythm Guide will use the same Rhythm Pattern and beat for each Track. With BOSS, you can never go wrong. Choosing which of these FOUR products to buy will definitely depend on what you require them for and what you want them to do for you.